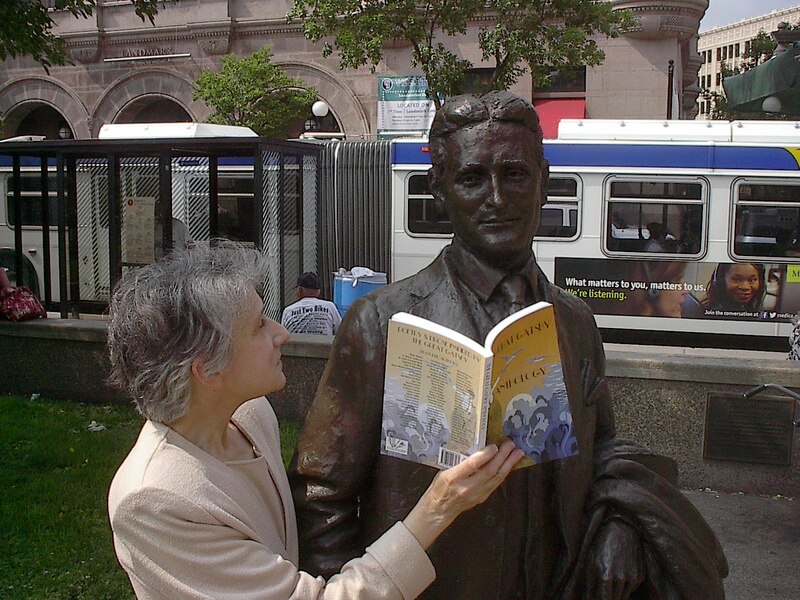 PHOTOGRAPH: Poet Maryann Corbett shares The Great Gatsby Anthology with the inspiration for her poem in the collection — the statue of F. Scott Fitzgerald in Rice Park, St. Paul, Minnesota, Fitzgerald’s hometown. ABOUT THE AUTHOR: Maryann Corbett contributed her poem “To the Statue of F. Scott Fitzgerald in Rice Park, Seen from the 53B” to The Great Gatsby Anthology. She is the author of three full-length books of poetry and two chapbooks. Her newest book Mid Evil is the winner of the Richard Wilbur Award, published by The University of Evansville Press. Her poems, essays, and translations appear widely in print and online journals and an assortment of anthologies. She is a past winner of the Lyric Memorial Award and the Willis Barnstone Translation Prize. She lives in Saint Paul, Minnesota, and works for the Minnesota Legislature. Her web page is maryanncorbett.com.